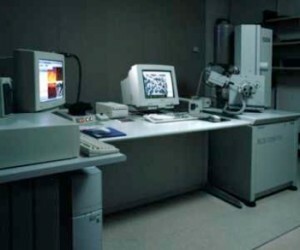 The FEI XL-30 ESEM FEG (right) and computer controls. One of the promises of the Internet is to put resources into the hands of those who wouldn't otherwise be able to access them. We often think of that in terms of information and data. But as the Imaging Technology Group at the Beckman Institute at the University of Illinois, Urbana-Champaign demonstrates, the Internet can also enable people to access hardware resources, not just software or information. In the case of the Beckman Institute, it's a $600,000 electron microscope that can now be used remotely. Called Bugscope, the project allows K-12 and undergraduate students to access and control the electron microscope from their classroom and view -- as the name suggests -- bug samples at up to a 20,000-fold magnification. Classes can mail in their insect specimens or use those provided by Bugscope. Doing so allows them to examine insect anatomy that's too small for regular classroom microscopes (which typically magnify up to 1000 times). "The whole idea is allowing a classroom to be like research investigators. The kids are the main actors. We are just support." And because of the design of the project, it also helps students experience other aspects of scientific research. Classes must propose their projects to Bugscope, for example, in order to use the microscope (although all legitimate proposals are accepted). And they have the opportunity to live chat with scientists during their session and ask them not just about insects or about electron microscopes but about careers in science. Bugscope hosted its first classroom session back in March of 1999, and since then there have been 580 classroom sessions with 415 schools. Bugscope has also been used in teacher education programs at several universities, helping model ways in which teachers can use technology to help foster scientific inquiry. Marquette University and California State University, East Bay, over the past 10 years (involving 870 students) have modeled strategies for use of technology to foster inquiry in a dynamic, real-time community of learners by contextualizing science content. Last month, the journal Science awarded the Bugscope project its SPORE Award, its Science Prize for Online Resources in Education. Bugscope collaborators Michele Korb and Umesh Thakkar explain how the program works to help train future scientists in an article in Science. "The whole idea is allowing a classroom to be like research investigators," Thakkar told the Sacramento Bee. "Each session is unique. The teacher has the power. The kids are the main actors. We are just support." Read about how a class in Palatine, Illinois uses a Geiger counter on the opposite end of the world -- in Australia to test whether sleeping with a cell phone under their pillows might be harmful.